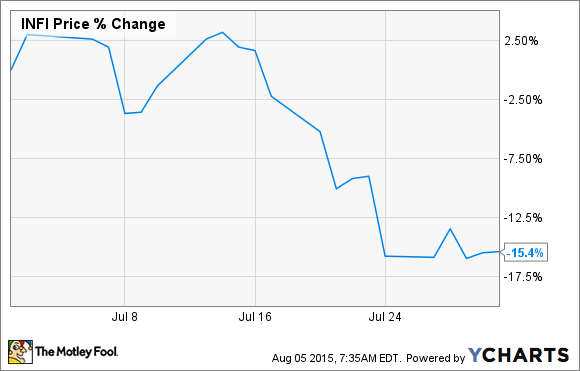 Infinity Pharmaceuticals' stock continued its recent nosedive in July. Is it now a compelling buy? What: Shares of Infinity Pharmaceuticals (NASDAQ:INFI), a clinical-stage biopharma company developing therapies for hard-to-treat diseases, lost another 15.4% of its value in July. The biopharma's shares have been falling like a knife ever since the company gave a handful of poster presentations for its experimental blood cancer drug duvelisib at the 2015 American Society of Clinical Oncology (ASCO) Annual Meeting last May. Specifically, Infinity's shares have shed a whopping 33% of their value since this meeting. Infinity is co-developing duvelisib with AbbVie across a host of hematological malignancies, including indolent non-Hodgkin lymphoma (iNHL) and chronic lymphocytic leukemia (CLL). So what: The somewhat puzzling part behind Infinity's rapid descent is that the four poster presentations held at ASCO reported some rather encouraging early-stage data for the drug in oncology. For example, a phase 1 study of treatment-naïve chronic lymphocytic leukemia patients receiving duvelisib resulted in an 88% overall response rate, including 15 partial responses out of 17 efficacy evaluable patients. Now what: Duvelisib is presently in two registrational studies for iNHL and CLL, respectively. However, the market appears to be concerned about its ability to compete in an increasingly crowded blood cancer market. Several clinical-stage CAR-T developers, for instance, have been blowing the doors off in terms of the efficacy observed for some of their products in early-stage studies. That said, Infinity's market cap after this dramatic downturn of only $432 million -- combined with its roughly $800 million partnership with AbbVie -- may represent a compelling bargain, depending on your view of duvelisib's chances of reporting positive top-line data in these pivotal trials. This small-cap biopharma merits watchlist status, in my book, because of the sheer size of the blood cancer market ($24 billion in 2014) -- but you may want to stay firmly on the sidelines until the drug is further along in the clinical trial process.